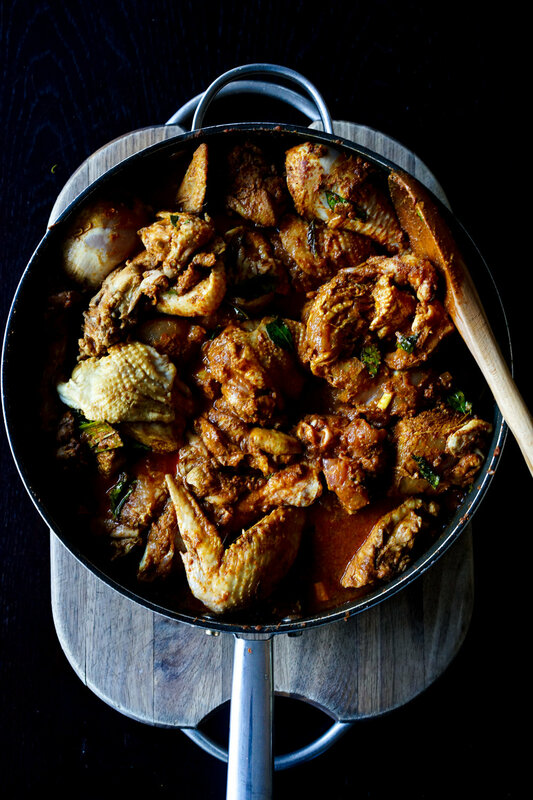 Chicken curry was a family staple for dinner at our home. It appeared like magic a few nights a week along with perhaps a lentil curry, gotu kola mallung (a finely chopped salad of Indian pennywort) or okra salad and a side of freshly fried pappadums for added crunch. I took for granted the spicy savouriness of the curry as it permeated the rice and vegetable dishes, all carefully mixed and manipulated into a rough ball with the tips of my fingers for eating. And I certainly didn’t think about the making of it. Well executed magic is rarely seen. But it was the making of it which had somehow silently leached into my soul. So that afternoon as my mother rhythmically sashayed the spices across the gently heated frypan with a wooden spoon, the memories swirled around with the roasting aromas like golden phizzwizard dreams waiting to be caught. In an era of perfectly stacked and labelled Tupperware containers, I had forgotten that we had stored our spices in a stash of a dozen or so old instant coffee, Vegemite and “Chicken Tonight” pasta-bake sauce jars full to the brim with unmarked condiments and known only by their shape, colour and distinctive scent. They were all kept in the same spot in the bottom kitchen cupboard closest to the stove. If I was ever asked to retrieve a particular spice, I automatically knew which jar, opening and gently sniffing it just to confirm. And the sounds. 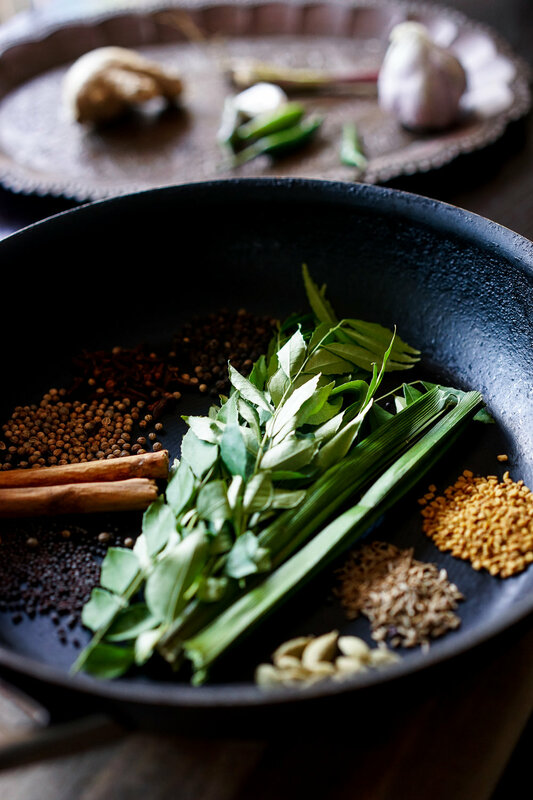 I had forgotten the silky sweeping swishes of dry roasting spices, the crackling of the fresh curry leaves hitting hot oil and the clipped chopping of vegetables for seemingly endless hours of preparation as we played, yelled and fought in the background. I wish I had told them that it was the smell of love. A deep love for a country hopelessly far away and culture so ingrained that it was practised unthinkingly every day, with food at its heart. A love of food itself, carefully selected and prepared and uncompromising in its standards. It was slow food before that was a thing – not that my mother would have thought about her cooking as such. She was surprisingly quick at it. And it was a love of family, who were adoringly nourished each day with homemade “meat-and-three-veg” the Lankan way, with a fiery kick! And that fiery kick defines my mother’s Sri Lankan Chicken Curry. I once asked her whether she could tone it down so that I could dole it out to some university friends and she exclaimed, “I don’t know how!” and then looking a little downcast after some thought she added, “maybe, but it’s not the same”. It was her way of saying that spicy heat is not a single, lone act but a part of an orchestra of flavours and textures in a multi-dish feast, where the level of heat is often moderated and complemented by all those other elements around it. That’s how it was meant to be authentically experienced. But my mother's other love of giving and sharing meant that she never stuck to her guns on this, always putting her feelings aside to reduce the chilli ingredients whenever she had to. So, go ahead, kill the chilli in this recipe if you need to. My mother certainly won’t judge. The hardest part about this recipe is sourcing the ingredients. Invest some time to find the freshest spices and produce you can - it makes a difference. After that, it's making the Roasted Curry Powder, which doesn’t have any complications as such but it asks of your time and patience. Once made however, the Roasted Curry Powder can be stored for up to a year and used in other Sri Lankan meat and vegetable dishes, so I reckon it’s time well spent. Otherwise, make an afternoon of it by bringing some friends together, opening a couple of bottles of Domaine Simha Sanskrit Rosé (whose musky spice notes pair perfectly with this dish) and start creating your own memories with aromas of Sri Lankan spiced love. Add the cinnamon, cloves, cardamom to the frypan and continue stirring under the low heat for about 6 mins until those ingredients have also haven on a slightly darker hue. Add the fenugreek, cumin seeds, peppercorns and fennel seeds to the frypan and continue stirring for another 10 minutes. Finally add the black mustard seeds to the frypan and continue stirring until you hear those seeds popping, at which point take the frypan off the stove but continue to stir and dry roast the spices in the residual heat for another 3 minutes. For the Chicken Curry, put the chicken pieces into a large bowl and add the raw Sri Lankan curry powder, salt, turmeric and tamarind paste. Place the chilli powder into a small frypan and dry roast it on a medium heat until the red colour starts to deepen. Take off the stove and immediately add to the bowl containing the chicken and other spices. Mix everything in the bowl thoroughly and coat the chicken. Heat oil on a medium heat in a large frypan with a lid. Add onion, garlic, ginger, green chillies, pandan leaf, lemongrass and curry leaves and fry until golden brown. Turn the heat down to low and add the chicken pieces coated with spices. Stir altogether and fry the chicken pieces for about 1 minute until it becomes fragrant. Be careful not to burn it or the spices. Add the water (the water level should not be more than half way up the chicken pieces so don’t add the whole of the specified amount if it isn’t necessary^^^) and turn the heat up to high and cook covered with a lid for 25 minutes. Add the coconut milk, mix in thoroughly and bring to a simmer uncovered for 1 minute. Turn off the heat and sprinkle the Roasted Curry Powder over the top of the curry but DO NOT mix this in yet. Put the lid on the saucepan and allow the finished Chicken Curry to stand for about 10 mins. Mix the curry thoroughly before serving with rice, vegetables or salad and fried pappadums. * This should yield 2 drumsticks, 2 thighs, 2 breasts cut into 3 equal parts and 2 wings. Alternatively, buy enough chicken pieces with bone for 6 people. *** If you dislike spicy heat, reduce the quantity of green chillies and chilli powder. Note that putting little or no chilli powder in will affect the curry’s final colour from that pictured in the photos. ^ The idea is to slowly warm to spices to release the aromatics without burning them. The order in which spices are added to the dry roast is related to its ability to withstand that heat before it burns and become useless. 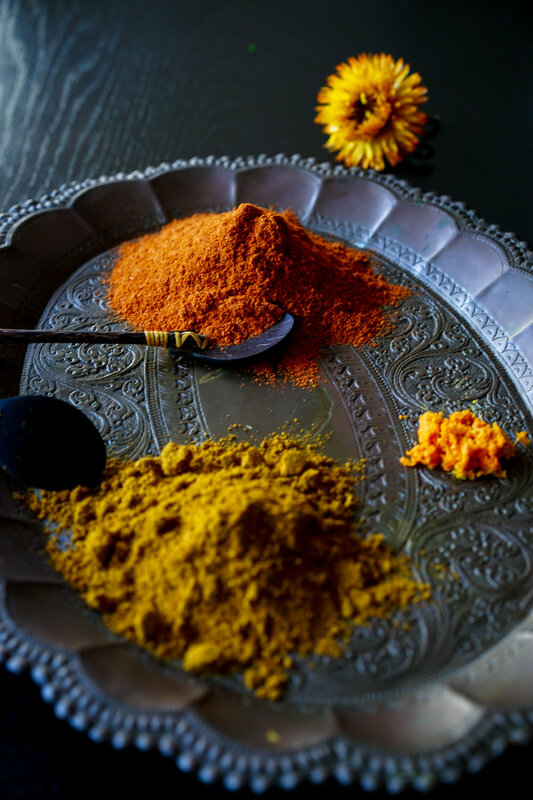 If in doubt, closely monitor the colour of the spices as you are roasting them – slow discolouration is the goal. ^^ The Roasted Curry Powder will keep for at least a year before there is much loss of flavour requiring you to make a fresh batch. Make sure it is kept in an airtight container (preferably glass) and stored away from light. ^^^ Be careful not to add too much water at this stage as it can make the consistency of the final curry too watery because the chicken pieces release their own juices into the pan in the cooking process.